Lahore (Muhammad Yasir) Dawlance is Pakistan’s market leader in home-appliances and a fully owned subsidiary of Arcelik – the largest Turkish enterprise, which is also the third-largest manufacturer in Europe. Being the most reliable brand, Dawlance has now unveiled its innovative ONE TOUCH Dishwashing machine in Pakistan, to create unmatched convenience for the consumers and pleasant experiences for the household. 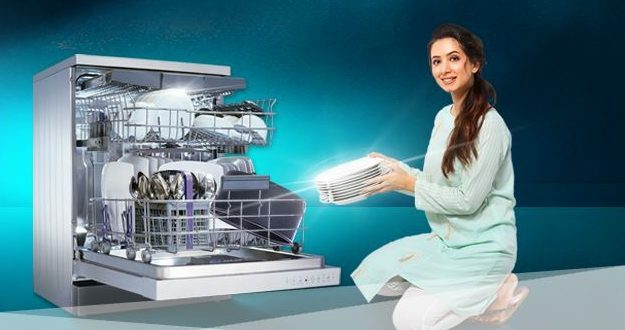 Dawlance is already the market-leader in Pakistan’s Dishwasher market. With the introduction of this One Touch Dishwasher, its consumer-base, brand-equity and perception will be further strengthened. With the selection of the right programme, this complete One-Touch solution effectively washes and removes the toughest of Pakistani stains at high temperature, which is not possible with handwash. This dish-washer is enriched with a dedicated Dirt-Sensor. Once the dishes are loaded, it detects the level of soiling to automatically decide the details of the wash-cycle. It also features a Load-Sensor to detect the number of utensils, loaded in each wash-cycle. So now, with Dawlance’s 10 years of Inverter Warranty, you can enjoy a life-time of clean dishes, with just One Touch. For the ability to wash 140 utensils in one cycle, the user can choose from a 12-place setting, to clean all kinds of utensils used in Pakistan. With an energy-conservation rating of A++, this product promises a lifetime of significant savings on your electricity bill. While its Silent-Operation (44 Decibels only) keeps the household very quiet, even during your daily dishwashing routine. Similar to the previous Dawlance models, this new dish-washer has a complete Stainless steel interior, that promises fully hygienic and healthy utensils and dishes for the consumer families.